This article is the second in a two-part series. Part one focused on the Exercise Crocodile Strike. Part two reflects on the future of the Marine rotational force. The Top End’s monsoonal weather pattern is the major reason why US Marine Rotational Force-Darwin (MRF-D) is currently limited to six-monthly rotations. In the dry season, from April to November, flying conditions are near perfect: the current rotation has operated since April without losing a single flying day. The Marine aviators I spoke with on Exercise Crocodile Strike were all highly positive about the training opportunities in Northern Australia, in comparison with other deployments. The sixth rotation includes an aviation element composed of four MV-22 Ospreys, four UH-1Y Venom utility helicopters and five AH-1W Super Cobra attack helicopters. These operate from a corner of RAAF Base Darwin. It is hoped that the next rotation will expand on this, ideally bringing out a full squadron of 12 Ospreys. Exercise observers, US Marines and ADF personnel on the USMC flight line at RAAF base Darwin. The absence of fixed-wing aviation is one obvious inhibitor for MRF-D to train to its full potential as a Marine Air-Ground Task Force (MAGTF). USMC F/A-18s from Iwakuni Air Station, in Japan, have already deployed for air exercises in Northern Australia. Hypothetically, a detachment of USMC F-35Bs, from Iwakuni or elsewhere, could be based temporarily at RAAF Tindal in the Northern Territory, similar to the F-22 deployment earlier this year (including a embedded Australian pilot). Administratively, this is likely to fall under the EAC strand of the US Force Posture Initiative, as infrastructure upgrades at Tindal are being co-funded by the RAAF and USAF. As well as significantly raising the complexity threshold of MRF-D’s training activities, USMC fixed-wing aviation should be attracted to Australia by access to the fully instrumented Delamare air weapons range, where the RAAF’s F-35As will soon begin training in an electronic warfare environment and virtually unrestricted airspace. The lack of a naval strand to the US Force Posture Initiative makes it appear service-imbalanced. But this has not precluded US Navy ships from calling at Darwin, or from cooperating extensively with the Royal Australian Navy in other settings. Tidal fluctuations are an issue around Australia’s Top End, but the USS John McCain visited Darwin earlier this year and MRF-D’s logistics supply chain runs through the port. So, where does MRF-D go from here? As the USMC is primarily an amphibious arm, its rotational presence in the Northern Territory will to some extent remain an orphaned force until amphibious operations are possible out of Darwin. Locating more ADF and international amphibious activities there would maximise full-spectrum training. Darwin could be designated as a regional amphibious training hub, with the aim of drawing in multinational participants, including from Southeast Asia. For now, MRF-D remains ground-heavy. But even within these constraints, the training opportunities are such that the outgoing battalion, currently 3rd Battalion, 4th Marine Regiment, is on an upward trajectory at the end of its six-monthly rotation. Readiness normally peaks somewhat earlier on overseas deployments. Exercise Crocodile Strike observers inside a US Marine MV-22. Despite the demise of the US pivot strategy, the Force Posture Initiative lives on, with the backing of US Secretary of Defense James Mattis. Significantly, I understand the US Marine commander in the Pacific Lieutenant General Berger has indicated his willingness to allow MRF-D to serve under Australian command if the operational need arises. That opens the possibility of future rotational detachments partaking in Australian-led disaster relief missions in Southeast Asia and the South Pacific, or potentially a RAMSI-type stabilisation effort. This would be a natural progression after years of ADF niche contributions to the Middle East and Afghanistan, as well as a direct demonstration of regional value-added within the Alliance for Australia. It would also demonstrably counter the lingering impression that Australia is permanently cast as the US’ deputy sheriff in the region. In short, it would be a good development for the health of Alliance at various levels. There is a more immediate deployment possibility for MRF-D, if entirely speculative on my part. When PNG hosts the APEC summit in mid-November 2018, the next Marine rotation could be extended to northern Queensland to augment the summit security arrangements. Any request for assistance would of course have to come from the PNG government. 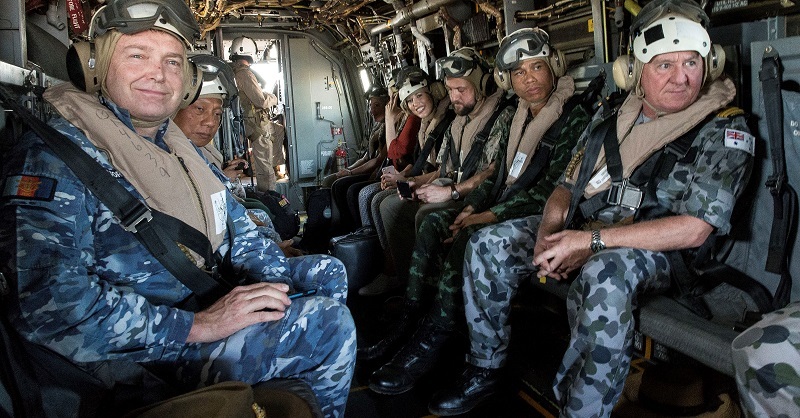 But from Cape York, the Marines could potentially serve as a rapid reaction force within MV-22 range of Port Moresby, without the need for the US to undertake an offshore deployment. A temporary USMC presence in Queensland could also open up three-way interactions with the ADF and Singaporean armed forces training at Townsville and Shoalwater Bay. One underlying question to the Marine presence in Australia from the outset is what national caveats may be attached to its deployment in a crisis. While all Force Posture Initiative activities are mutually agreed, Canberra would have a say on any unplanned operation that might be performed by the US Marines out of Darwin, subject to Alliance consultations. In practice, it is hard to envisage a scenario where the Australian government would decline a US request to deploy from Darwin. But the fact that MRF-D operates under Australian sovereignty is a point worth emphasising to regional observers. Over the past six years, the US Marine presence in Darwin has grown incrementally to become part of the social as well as the strategic fabric of the Northern Territory. Exercise Crocodile Strike has stretched that skin a little further. It remains a modest-sized force, not yet optimally realized and to some extent still searching for its mission. But its continuation does not appear in doubt, despite the transition to a new political administration in the US. If the biggest threat overhanging MRF-D is the budgetary axe, then the training and locational advantages of Northern Australia will continue to make a persuasive case for its existence.